New Brunswickers who work outside have expressed concern about giant hogweed, a noxious and potentially dangerous weed that was first discovered in the province in 2010. Giant hogweed (Heracleum mantegazzianum) is considered an invasive species in North America. Like the name suggests, it can grow quite large, with mature plants reaching up to six metres high. If its sap comes into contact with moist skin and is then exposed to sunlight or UV-rays, it can cause severe phytophotodermatitis (skin inflammation). Initially, the skin turns red and itchy, with large, sunlight-sensitive blisters forming within 48 hours. These blisters can eventually form black or purplish scars that can remain UV-ray sensitive for years. Also, the presence of even a tiny amount of sap in the eyes can burn the cornea and lead to temporary or permanent blindness. Do not purchase, trade or grow giant hogweed in your garden. Only buy native or non-invasive garden plants. 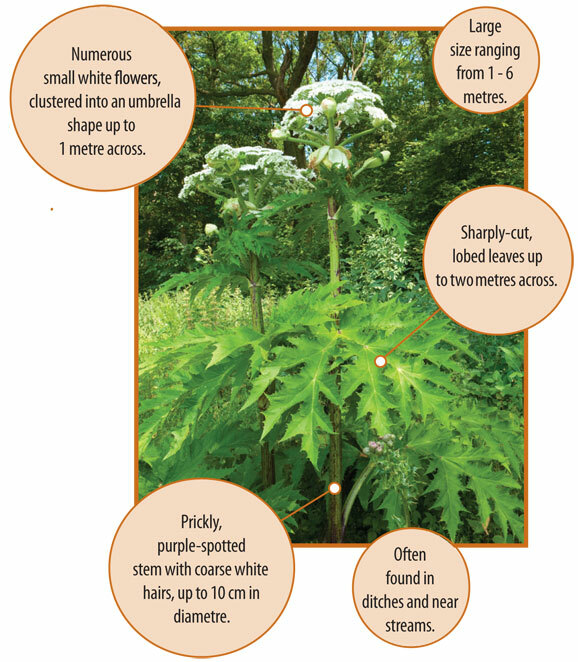 If you find giant hogweed on your property, it is highly recommended that you contact a professional exterminator to remove it. If you must remove the plant yourself, wear protective clothing, including waterproof gloves, long-sleeve shirts, pants, and eye protection. It is ideal to wear a disposable “spray suit” coverall on top of your normal clothing. Avoid touching your eyes or wiping the sap on other parts of your body or clothes. If contact with skin occurs, wash immediately with soap and water, avoid sunlight exposure and seek medical treatment. If contact is made with the eyes, flush immediately with water and seek medical treatment.